Flood barriers protecting Bangkok are almost overflowing and worries in the city are high that they could fail in the coming hours. 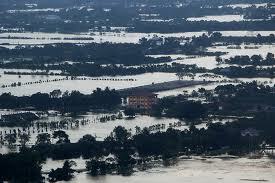 Thailand is suffering its worst flooding in half a century, triggered by unusually heavy monsoon rains which have already killed at least 373 people, and left 113,000 homeless with 720,000 needing medical attention. http://www.euronews.net/ The next in line to the throne in Saudi Arabia has been named as Interior Minister Prince Nayef. It follows the death of the previous heir, Prince Sultan, Nayef’s brother who died a week ago. Nayef is more conservative than the current king and is believed to have close ties to the Saudi religious establishment. 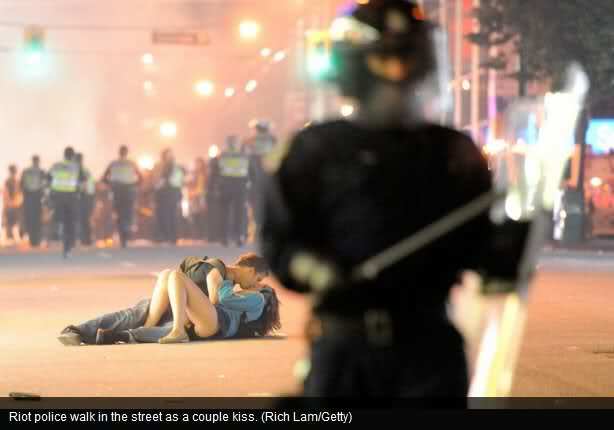 Mad Canada Riots- what is man but an occasional madness? Iits a crazy world, like its crazy people? 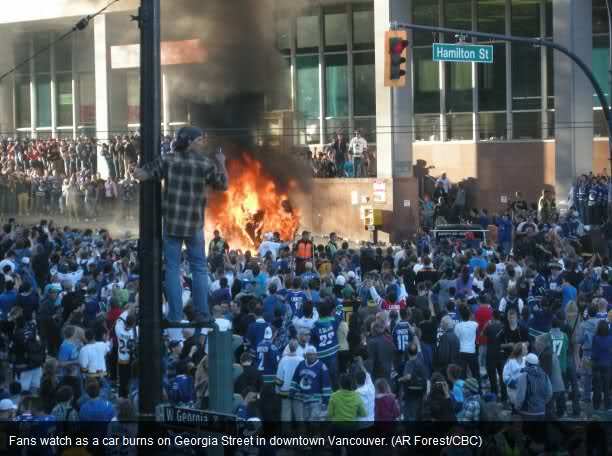 Angry, drunken revellers ran wild on Wednesday night after the Vancouver Canucks’ 4-0 loss to Boston in Game 7 of the Stanley Cup finals, setting cars and garbage cans ablaze, smashing windows, showering giant TV screens with beer bottles and dancing atop overturned vehicles. Later, looters smashed windows and ran inside department stores. There were no immediate indications of injuries, although images were shown on television of at least one woman mopping blood from her forehead. Vancouver Mayor Gregor Robertson praised the police and firefighters and asked people to stay away from the central downtown area. Tear gas mingled with the stench of acrid smoke and stale beer as riot police, truncheons drawn, moved in to quell the violence, pushing crowds away from the burning cars. Later, police cars also were set on fire. A student from Saudi Arabia arrested for attempting to blow up nuclear plants in US and the residence of former President George W Bush [ Images ], appeared in a federal court and pleaded for guilty. US Marshals escorted handcuffed Khalid Ali-M-Aldawsari into US District Court, Northern District of Texas on Friday, two days after he was arrested on terror charges. The Justice Department said Aldawsari bought explosive chemicals online and planned to blow up dams, nuclear plants, or the Dallas home of former President George W Bush. Aldawsari, 20, reportedly said he had been inspired by 9/11 and speeches by Osama bin Laden [ Images ]. When asked by Judge Nancy Koenig if he understands the charges against him, he replied: “Yes, I do”. Judge Koenig also asked Aldawsari if the Saudi Consulate had contacted him. He answered, “Yes”. The judge ordered him to remain in custody until a March 11 detention hearing. However, if convicted, Aldawsari, who faces charges of attempted use of a weapon of mass destruction will serve a maximum penalty of life in prison. In his journal, the college student from Saudi Arabia who studied chemical engineering in Texas described a plan to travel to New York City, place bombs in several rental cars for remote detonation and leave the vehicles in different places during rush hour, according to court documents released on Thursday. “After mastering the English language, learning how to build explosives and continuous planning to target the infidel Americans, it is time for jihad,” or holy war, Aldawsari wrote in the journal, according to the documents filed by prosecutors. In a statement, Aldawsari’s attorney Rod Hobson called press coverage since his client’s arrest “very one-sided and biased,” and suggested it has made it difficult for Aldawsari to receive a fair trial in Lubbock. “This is not ‘Alice in Wonderland’ where the Queen said, ‘First the punishment, then the trial,'” Hobson said. “This is America, where everyone is entitled to the presumption of innocence, due process, effective representation of counsel and a fair trial. “This is a wonderful opportunity for us to show the world how truly fair our legal system is; even to those who are accused of trying to harm our country,” he said. “As we lay out in this affidavit, there were a range of targets being contemplated,” Robert Casey, the FBI special agent in charge of the case, said. Aldawsari, who was legally in the US on a student visa, studied chemical engineering at Texas Tech University until January before transferring to a nearby college to study business. The White House said President Barack Obama [ Images ] was notified about the alleged plot before Aldawsari’s arrest. Telephone numbers that Aldawsari had provided to others were not working on Thursday. No one answered the buzzer or a knock on the door at the address listed as Aldawsari’s apartment near the Texas Tech campus. The case outlined in court documents was significant because it suggests that radicalised foreigners can live quietly in the US without raising suspicions from neighbours, classmates, teachers or others. But it also showed how quickly US law enforcement can move when tipped that a terrorist plot may be unfolding. “We think we have neutralised any other threats or imminent harm surrounding the actions that he’s charged with, but the investigation is continuing,” Casey said. 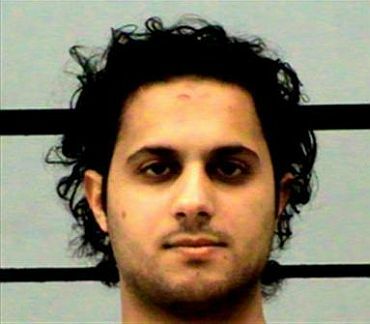 Aldawsari wrote that he was planning an attack even before coming to the US on a scholarship, the court documents said. He said he was influenced by bin Laden’s speeches and he bemoaned the plight of Muslims. Federal authorities said they learned of the plot after a chemical company, Carolina Biological Supply of Burlington, N C reported $435 in suspicious order by Aldawsari to the FBI on February 1. Separately, Con-way Freight, the shipping company, notified Lubbock police and the FBI the same day with similar suspicions because it appeared the order wasn’t intended for commercial use. Within weeks, federal agents had traced Aldawsari’s other online purchases, discovered extremist posts he made on the Internet and secretly searched his apartment, computer and e-mail accounts and read his diary, according to court records. The FBI said the North Carolina company reported the attempts to purchase 1.3 gallons of phenol, a chemical that can be used to make the explosive trinitrophenol, also known as TNP, or picric acid. Aldawsari falsely told the supplier he was associated with a university and wanted the phenol for “off-campus, personal research,” according to court records. Frustrated by questions, Aldawsari cancelled his order and later e-mailed himself instructions for producing phenol, the documents say. TNP, the chemical explosive that Aldawsari was suspected of trying to make, has approximately the same destructive power as TNT. FBI bomb experts said the amounts in the Aldawsari case would have yielded almost 15 pounds of explosive. That’s about the same amount used per bomb in the London [ Images ] subway attacks that killed scores of people in July 2005. Prosecutors said that in December, he bought 30 litres of concentrated nitric acid for about $450 from QualiChem Technologies in Georgia, and three gallons of concentrated sulfuric acid that are combined to make TNP. The FBI later found the chemicals in Aldawsari’s apartment as well as beakers, flasks, wiring, a Hazmat suit and clocks. A Saudi industrial company, which was not identified in court documents, was paying Aldawsari’s tuition and living expenses in the US. Khalid Aldawsari came to the South Plains in 2009 in pursuit of a chemical engineering degree at Texas Tech. Much like the terrorists who executed the 9/11th attacks, Aldawsari laid low. He lived quietly in Lubbock for almost two years. To those who lived with him behind the gates of the Centre at Overton Park, the 20-year-old Saudi Arabian was just another college kid with headphones in his ears, who really kept to himself. “I was really shocked to get this phone call because he was a very good student by all means,” Bosun Jang, a former academic adviser of Aldawsari, said. According to his blog, Aldawsari’s plan was to use a scholarship from Saudi Arabian Basic Industries Corporation (SABIC) to enter the country. Excerpts from Aldawsari’s blog state: “the sponsoring corporation’s financial scholarship is the largest, which will help tremendously in providing me with the support I need for Jihad, God willing. And now, after mastering the English language, learning how to build explosives, and continuous planning to target the infidel Americans, it is time for Jihad”. FBI reports indicate Aldawsari expressed in other online postings that his inspiration was Osama bin Laden himself and specifically the events of September 11. Even going as far as to write: “I wish to create an Islamic group under the banner of Al-Qaeda [ Images ] and sharing Al-Qaeda’s agenda. “They have brainwashed him and told him if you do some extremist or violent actions, then God will be pleased with you and he will take you to heaven,” Samer Altabaa of the Islamic Centre of the South Plains said.